According to various published studies, Dental implants seem to be more durable than bridges or removable prostheses. In the same way as for a natural tooth, it is difficult to predict the lifespan of an implant as this depends on a large number of factors. quality and balance of the prosthetic teeth on the implant. distribution of forces in the implant. patient’s oral and dental hygiene. how frequently check-ups are performed. The study was conducted over a period of 20 years. 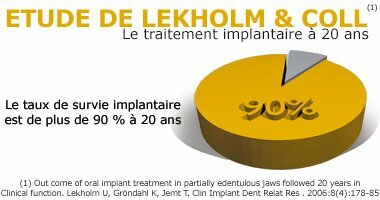 Implant survival rate was 91% at 20 years. In other words, a patient who has implants has a 9 in 10 chance of still having the same implants and implant prostheses in 20 years’ time. Implant treatment is the most reliable prosthetic treatment in many situations. The majority of complications occur in the first few months of healing and osseointegration. This is often due to deficient osseointegration as a result of fibrous tissue interposition. The implant is mobile and painful. It has to be taken out under local anaesthetic. A new implant can generally be re-mounted a few weeks or months after healing has taken place. Dental implants are a proven and reliable technique. There are few contraindications to surgery.